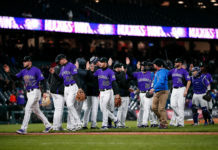 With an extra-innings win on Wednesday night, the Colorado Rockies completed a stunning three-game, road sweep of the Milwaukee Brewers to get their 2015 season started off on the right foot. The Rockies hadn’t previously won a road series since June of 2014. Wilin Rosario – who was displaced by the offseason acquisition of catcher Nick Hundley – provided the heroics with a go-ahead homerun in his first at bat of the season in the top of the 10th inning on Wednesday. Former Brewers closer John Axford recorded his 117th career save in the bottom of the inning to complete the sweep. Axford dedicated the save to his 2-year-old son, Jameson, who is still in the hospital after being bit by a rattlesnake in Arizona during spring training. That save was for Jameson! 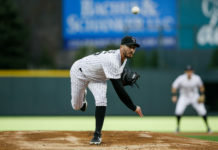 Promising 24-year-old pitcher Eddie Butler allowed four hits and two runs with five strikeouts in five and two thirds innings of work. Corey Dickerson hit his second homerun of the series and Carlos Gonzalez provided a 466-foot bomb to center field. LaTroy Hawkins had the Brewers down 4-2 and on their last out in the ninth inning before he blew the save to RBI hits by Ryan Braun and Carlos Gomez. The first two games of the series came with much less drama as Colorado won by margins of 10-0 and 5-2. 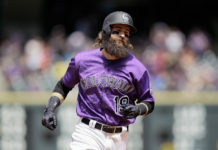 The Rockies tied a New York Giants record from 1912 with 12 doubles in the first two games of the season. In total, the Rockies ripped the Brewers pitching staff for 38 hits, 16 doubles, five dingers, and 20 runs in the series. 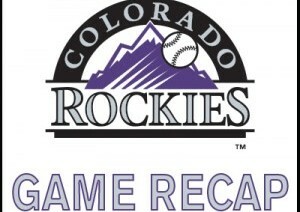 For just the second time in club history, the Rockies shutout their Opening-Day opponent. Kyle Kendrick became the third Opening-Day starter in the history of the club to not to allow a run. Nolan Arenado and Dickerson each hit a homerun, a double, and four RBIs in the blowout victory. Dickerson became the fourth player in Rockies’ history to hit a homerun in the first inning of the season. According to Elias Sports Bureau, it was MLB’s largest shutout victory in a season-opener since 1988 and just the second time an NL team recorded an opening-day shutout with 10 or more runs. The last time an NL team did so was when the Pittsburgh Pirates beat the Cincinnati Reds 14-0 in 1911. Colorado kept the bats hot with six doubles and 12 hits on Matt Garza in a 5-2 win in the second game of the series. Troy Tulowitzki, Arenado, Hundley, and DJ LeMahieu each provided an RBI on multiple hits in the victory. Starting pitcher Jordan Lyles was solid – allowing two runs on five hits in six innings in his season debut. Colorado had plenty of standout performances, but none more impressive than the series that Dickerson produced. The 25-year-old went 5-for-12 with two homeruns, three runs, and six RBIs. Arenado and Tulowitzki each produced six hits in the series. Gonzalez registered five hits, four RBIs, and four runs on three doubles and one homerun.